Robotics is the branch of science consisting of a diverse range of technologies including mechanical engineering, electrical engineering and computer science. Robotics covers the design, construction, operation and use of robots, as well as computer systems for their control, sensory feedback and information processing. The aim of robotics is to create interactive, cognitive and automated systems that can extend human capabilities to solve real world challenges. Pre-Programmed Robots – Robots that operate in a simple, controlled environment such as a car factory. Autonomous Robots – Robots that operate independently of human operators and can detect and adapt to changes in the environment. These robots are used in fields such as spaceflight, household maintenance, waste water treatment and delivering goods and services. Teleoperated Robots – Robots that are controlled remotely by a human being. Examples included the underwater robots that help fix oil leaks, or the robotic arm on the Space Shuttle (the use of such robots in the medical field is a key growth area). Augmenting Robots – Robots that are connected directly to the human user’s body. Movements of the user’s body ultimately control a robotic effector of some kind. These robots can either enhance the user’s natural skill in some way (e.g., extending their reach) or give them a skill they don’t have or have lost (e.g., a robotic prosthetic arm). With rapid advancements in technology, robots are becoming more sophisticated and able to assume more roles such as personal assistants, delivery vehicles, surgical assistants, exoskeletons, autonomous vehicles and unmanned aerial vehicles. As a result investments in robotics start-ups have risen substantially, and according to a market research report the service robotics market is estimated to reach USD $18.02 Billion by 2020. We reached out to some of the top influencers on our list to ask them for their views on future of work. We spoke to Mike Quindazzi (#6), Jason Schenker (#8), Spiros Margaris (#10), Dr. Bertalan Mesko, PhD (#17), Patrick Meier (#18) and Zoltan Istvan (#20). Be sure to follow them to stay up to date on the best content and resources on robotics. 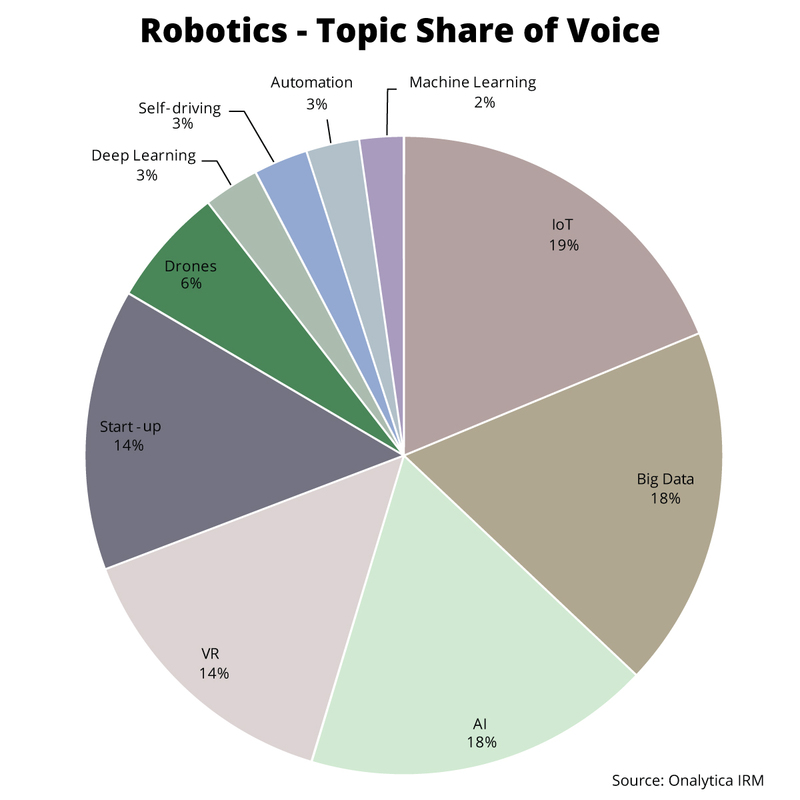 The most popular topic mentioned in tweets and blogs by the top future of work influencers was IoT with a 19% share of voice, illustrating the strong relationship between IoT and Robotics. Big Data and AI were the 2nd most popular topics both receiving 18% of all mentions among the top robotics influencers and brands. The next most popular topics were VR and Start-up which both received a 14% share of voice. Drones received a 6% share of all mentions, followed by Deep Learning, Self-driving and Automation which all received a 3% share of voice. Finally Machine Learning received a 2% share of mentions among the top 100 robotics influencers and brands. We were very interested in seeing which brand and individuals were leading the discussion around robotics, so we analysed over 551K tweets mentioning the key words: “Robotics OR Robotic from 18th September – 18th November 2016. We then identified the top 100 most influential brands and individuals leading the discussion on Twitter. What we discovered was a very engaged community, with much discussion between individuals and brands. 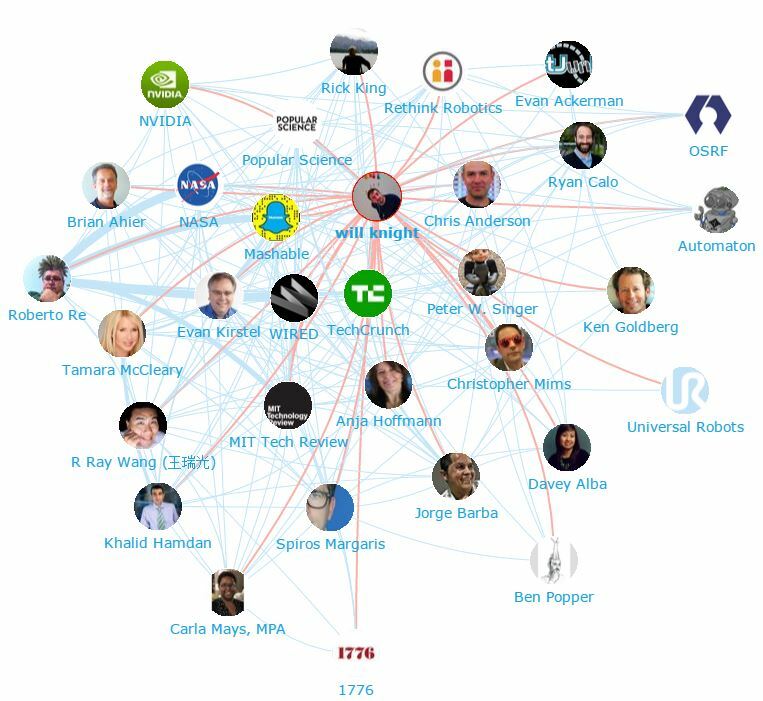 Below you can see a network map of the online robotics conversation with the number one influencer Will Knight at the centre. This map was created with our Influencer Relationship Management software (IRM). Be sure to click on the map to enjoy the full size network diagram in greater detail. Below you can see another network map created with our Influencer Relationship Management software (IRM) showing the number 1 brand NASA at the centre and all the robotics conversations to and from the influencers in their field. If you are interested in learning more about identifying, managing and engaging with influencers click here to get in touch! 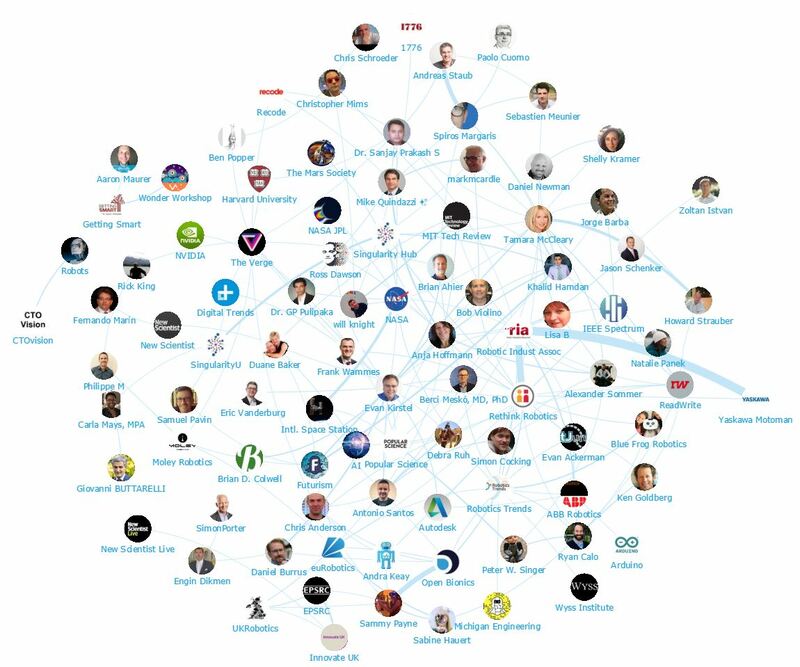 We looked at all the individuals engaging on Twitter to bring you a list of the top influencers in robotics. Below is the top 50, if you want to see who ranks from 50-100 be sure to download the full report by clicking the download button below. 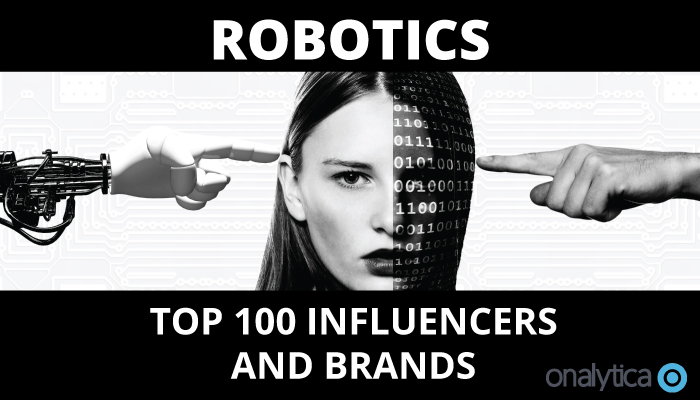 We also looked at all the brands engaging on Twitter to bring you a list of the top brands talking about robotics. Below is the top 50, if you want to see who ranks from 50-100 be sure to download the report to get the full top 100 list, and see who are most the influential brands in robotics.